Join us in The Merc for chamber performances by the region’s best professional musicians. The intimate setting of The Merc allows the audience and musicians to interact with each other so you can learn about the musicians, their instruments, their careers, and the music they perform. 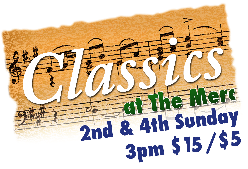 A great classical experience for a great price!